Imbolc (Imbolg) the festival marking the beginning of spring has been celebrated since ancient times. It is a Cross Quarter Day, midpoint between the Winter Solstice and the Spring Equinox, it can fall between the 2nd & 7th of February when calculated as the mid point between the astronomical Winter Solstice and the astronomical Spring Equinox, in 2019 it falls on February 4th. The astronomically derived date is later than the traditional date of January 31st / February 1st. Imbolc derives from the Old Irish i mbolg meaning in the belly, a time when sheep began to lactate and their udders filled and the grass began to grow. At the Mound of the Hostages on the Hill of Tara the rising sun at Imbolc illuminates the chamber. 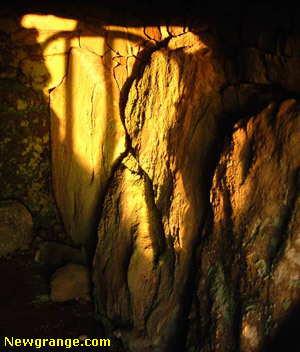 The sun also illuminates the chamber at Samhain, the cross quarter day between the Autumn Equinox and the Winter Solstice. The Mound of the Hostages at Tara is a Neolithic Period passage tomb, contemporary with Newgrange which is over 5000 years old, so the Cross Quarter Days were important to the Neolithic (New Stone Age) people who aligned the chamber with the Imbolc and Samhain sunrise. In early Celtic times around 2000 years ago, Imbolc was a time to celebrate the Celtic Goddess Brigid (Brigit, Brighid, Bride, Bridget, Bridgit, Brighde, Bríd). Brigid was the Celtic Goddess of inspiration, healing, and smithcraft with associations to fire, the hearth and poetry. When Ireland was Christianised in the 5th century, the mantle of the Goddess Brigid was passed on to Saint Brigid, born at Faughart, near Dundalk, Co. Louth. She founded a monastery in Kildare and ended her days there. The goddess Brigid festival was Christianised to become Saint Brigid's Day. 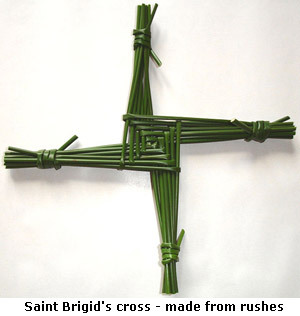 The Saint Brigid's Cross is one of the archetypal symbols of Ireland, while it is considered a Christian symbol, it may well have its roots in the pre-christian goddess Brigid. It is usually made from rushes and comprises a woven square in the centre and four radials tied at the ends. The Saint Brigid's Cross was traditionally hung on the kitchen wall to protect the the house from fire and evil. Even today a Brigid's Cross can be found in many Irish homes, especially in rural areas. In Christian mythology, St. Brigid and her cross are linked together by a story about her weaving this form of cross at the death bed of a pagan chieftain who upon hearing what the cross meant, asked to be baptized. Gerald of Wales reported in the 12th century that a company of nuns attended an ‘inextinguishable’ fire at Kildare in St Brigid's honour. Although it had been kept burning for 500 years, it had produced no ash. Men were not allowed near the fire. According to myth, Saint Brigid travelled to Glastonbury and set up a small chapel on Bride's Mound. She is one of the four holy people celebrated with a small stone monument in the Glastonbury Tercentennial Labyrinth. The author Felicity Hayes-McCoy links St. Bridget to the Celtic Goddess Danu. The stories associated with St. Bridget are echoes of the ancient story of the Goddess Danu. Danu’s people were tribal Celts who brought her worship with them to Ireland along with their skill as herdsmen and their knowledge of farming crops. Danu was their fertility goddess whose powerful energy revitalised the earth each year in spring. There are stories of seeds waking to the pressure of her feet, and flowers springing up where her cloak touches the fields. She was a powerful personification of fertility and in Celtic mythology, her marriage to the shining sun god Lugh combined the elements of light, heat and water which brought life to the fields in springtime. Danu’s name means ‘water’. Without water nothing can grow so, for the Celts, she was an image of the essence of life itself. And she’s the prototype of the medieval St. Bridget, who controlled the weather, cured infertility, blessed the housewives’ labour and increased the farmer’s herds. The chronology of Celtic Goddess Brigid transposing into the Christian Saint Brigid is not universally accepted. The first mention of the Goddess Brigid in Irish literature is in Cormac's glossary from the 10th century, there is no mention of the Goddess Brigit in the 8th to 10th century Mythological Cycle. So it could be argued that 5th century Saint Brigid predates the Goddess Brigid. Ancient cultures such as the Neolithic (Stone Age) people who build Newgrange in Ireland aligned their monuments to the major solar events, the Winter Solstice, the Spring Equinox, the Summer Solstice and the Autumn Equinox. The solar year was further divided to mark the half way points between the major solar events giving the cross quarter days of Imbolc, Beltane, Lughnasadh and Samhain.